The LA Metro Green Line Light Rail Extension to Torrance is still in early stages, but the City of Lawndale is prepared to stand in the project’s path – unless the project goes underground, as once suggested by LA Mayor Eric Garcetti. Metro representatives came to Lawndale that night to give the city and its residents an update on the project. Four pathway alternatives are currently on the table, starting from the Redondo Marine Green Line Station: One carries down Hawthorne Boulevard; two more extend down a railroad right of way; a fourth split the difference, going from Hawthorne to the ROW at Artesia Boulevard. Only Alternative 2, a ROW option, calls for trenching the light rail under street crossings. But Lawndale, which has long opposed the project, remains nonplussed and feels chafed by a promise to discuss true undergrounding by LA Mayor Eric Garcetti, then vice-chair of the Metro board of directors. On the dais, Councilman Jim Osborne described a private discussion with Garcetti, prior to an August 2016 meeting of the South Bay Cities Council of Governments. Garcetti was stumping in favor of LA County’s Measure M, a sales tax increase dedicated to improving transportation infrastructure. “He was there trying to get us to change our opposition to the tax measure. Before I said anything, he said ‘what if we underground it through Lawndale?’ I said that might solve everything,” Osborne said, continuing that Garcetti repeated the claim in a public forum. “So my question would be, was he just blowing smoke? Because that dropped immediately after Measure M passed,” Osborne said. SBCCOG Executive Director Jacki Bacharach confirmed that her organization has yet to hear anything further from Garcetti about undergrounding, but clarified that the SBCCOG is requesting Metro further explore the topic. 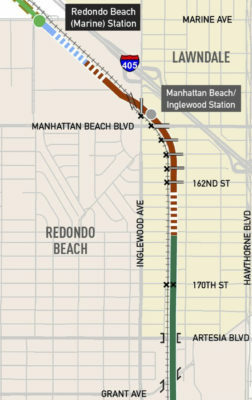 Alternative 2 includes an underground station at Manhattan Beach Boulevard and Inglewood Avenue. But a plan to run the Green Line as a subway below Lawndale may blow out the existing budget. Early Green Line extension cost estimates range between $890 million and $1.22 billion for the approximately 4.5-mile extension. By comparison, Metro’s Purple Line subway extension costs about $900 million per mile, according to Metro planning executive David Mieger. “Light rail trains are mostly street-running, lighter weight and shorter. The cases where we have to grade separate are for street crossings,” Mieger said. Redondo Beach, which has planned for the station to link with a forthcoming transit center near the South Bay Galleria, has taken a stance supporting Alt. 3, down Hawthorne Boulevard, with ROW-trenching Alt. 2 as a backup, so as to lessen disturbances to Redondo and Lawndale residents. “I’d much rather see it go down a commercial corridor than down residential neighborhoods,” said Redondo Mayor Bill Brand. The LA Metro board is scheduled to narrow the field of alternatives down to two at its Sept. 27 board meeting.